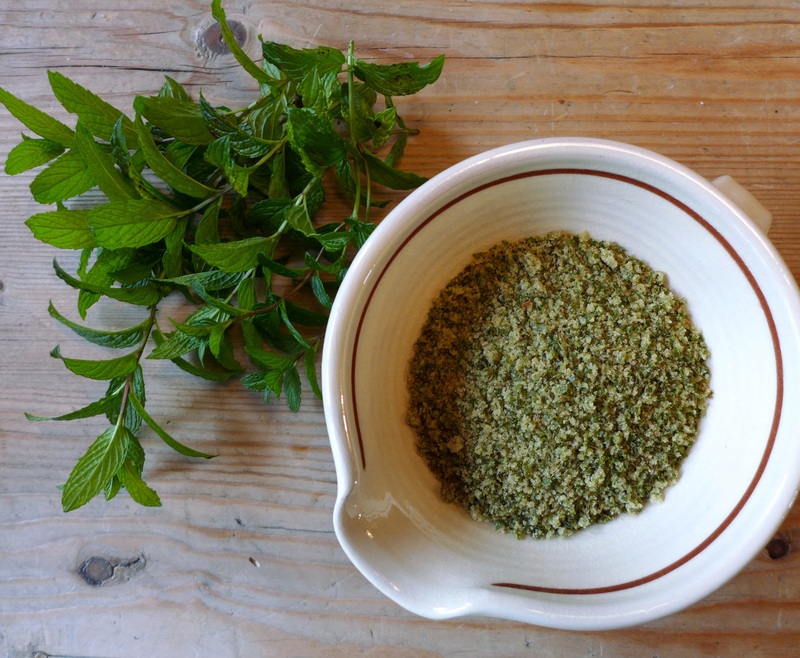 I needed to cut back my Moroccan mint before winter and didn’t want to waste the pepperminty leaves, so I made some mint sugar then had to decide what it would go best with. If you’re anything like as lazy as me, you’ll love this, an impressive-looking pud with minimum effort. Any mint will work here – apple, pineapple or chocolate mint would be particularly good, but the common-or-garden variety will work just as well. The sugar will keep its flavour for up to two weeks, once thoroughly dried out and stored in an airtight jar. If you have any left over, try using it to rim glasses for a mojito. The perfect excuse for a cocktail, as if you needed one. Put the mint leaves and sugar in a food processor and keep whizzing until the mint has completely broken down and you have what is best described as a green slurry. Scrape it into a wide, shallow container and let it dry completely, stirring from time to time to break up any clumps, then decant into an airtight jar. 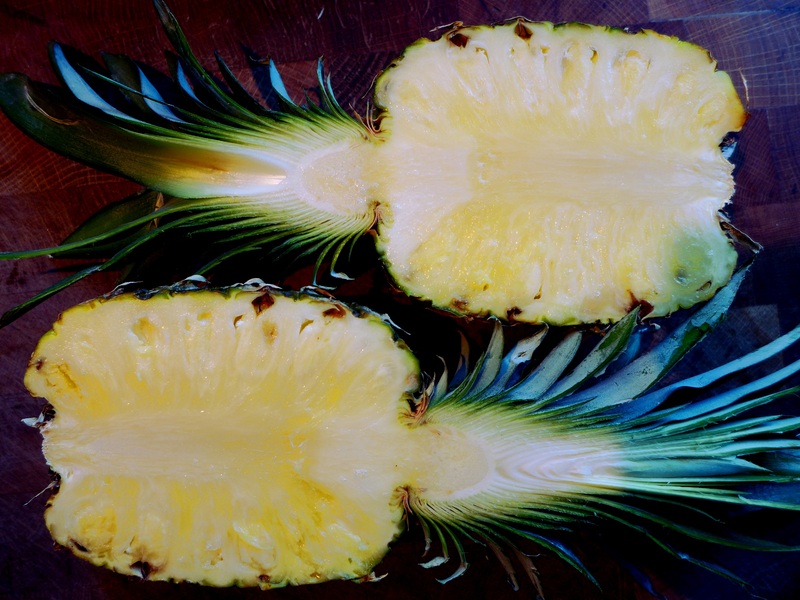 Cut the pineapple in half, leaves and all, then cut each half lengthways into two or three wedges, slicing out the core if it’s very hard. 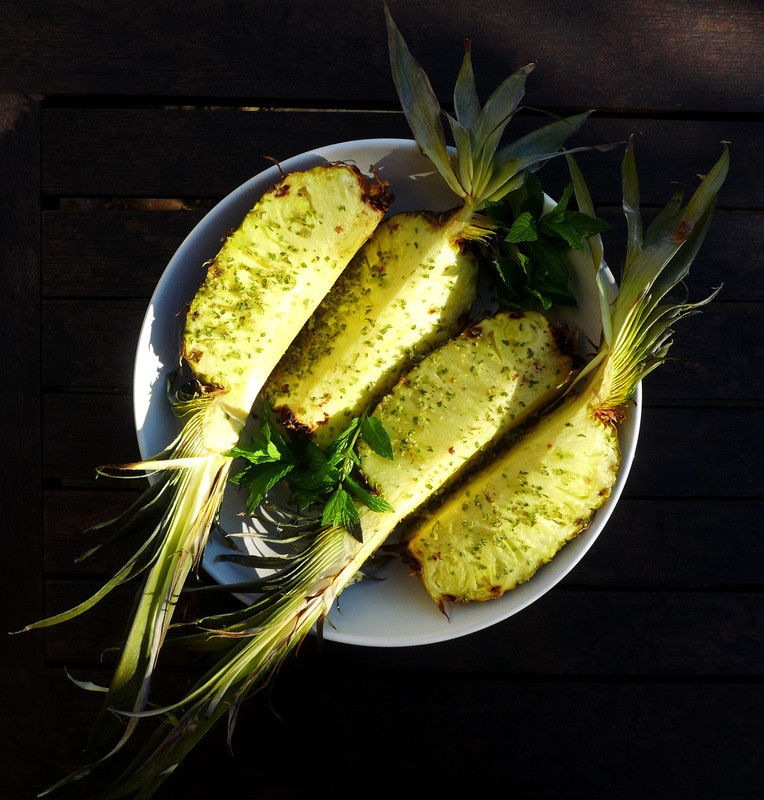 Heat the grill to medium-hot, line your grill pan with foil, and brush the pineapple wedges with melted butter. Cook for 5-7 minutes until heated through and the edges are browning. Pile onto a plate, sprinkle liberally with mint sugar, garnish with mint leaves and serve. 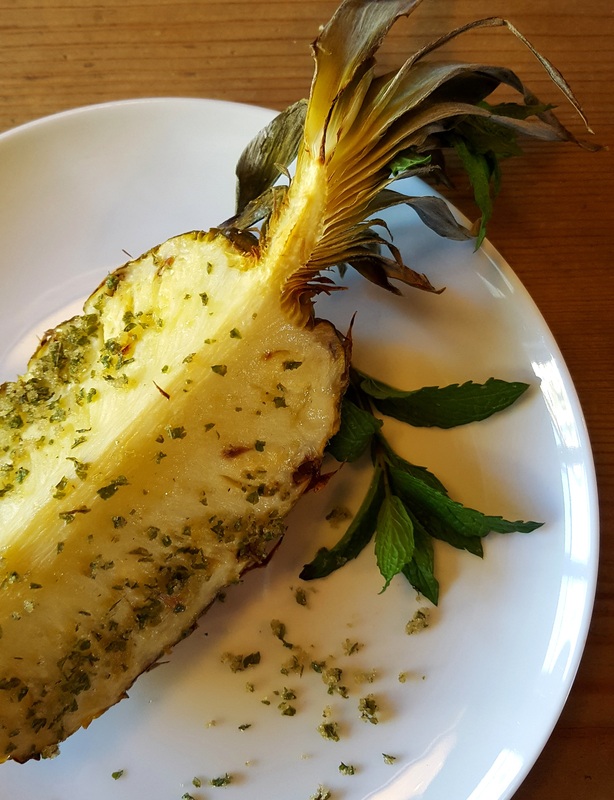 This entry was posted in Desserts, cakes and biscuits, Fruit and tagged easy desserts, grilled pineapple with mint sugar, mint sugar by Linda Duffin. Bookmark the permalink. It’s getting cold here and a tropical dessert is a perfectly lovely idea. Saying ‘hello’ from one of the pineapple countries of the world already basking in the 30s. Love all the mints and don’t use pineapples as dessert nearly often enough . . . thanks and shall try . . .
Linda, you know I have a mint plant in the back that is in prime shape and in need of harvest prior to the coming freezes. I think mint sugar is a brilliant Idea and with a maybe grilled pineapple, wow. Thanks for sharing. Sounds lovely and those jewel-like sprinklings of green against the yellow pineapple look very pretty indeed.